Pula or Pola ([pǔːla]; Italian and Istro-Romanian: Pola; Latin: Colonia Pietas Iulia Pola Pollentia Herculanea; Slovene and Chakavian: Pulj, German: Polei, Ancient Greek: Πόλαι, Polae) is the largest city in Istria County, Croatia and the eighth largest city in the country, situated at the southern tip of the Istria peninsula, with a population of 57,460 in 2011. 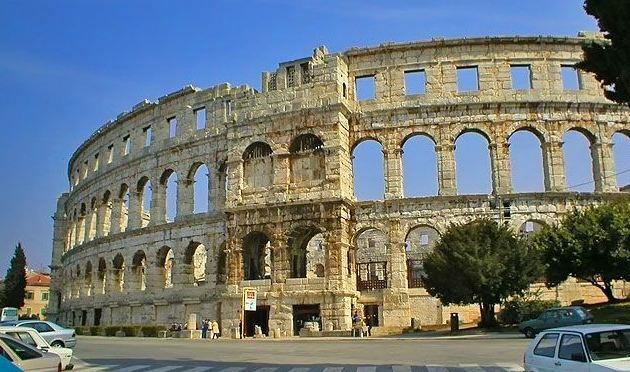 It is known for its multitude of ancient Roman buildings, the most famous of which is the Pula Arena, one of the best preserved Roman amphitheaters, and its beautiful sea. The city has a long tradition of wine making, fishing, shipbuilding, and tourism. 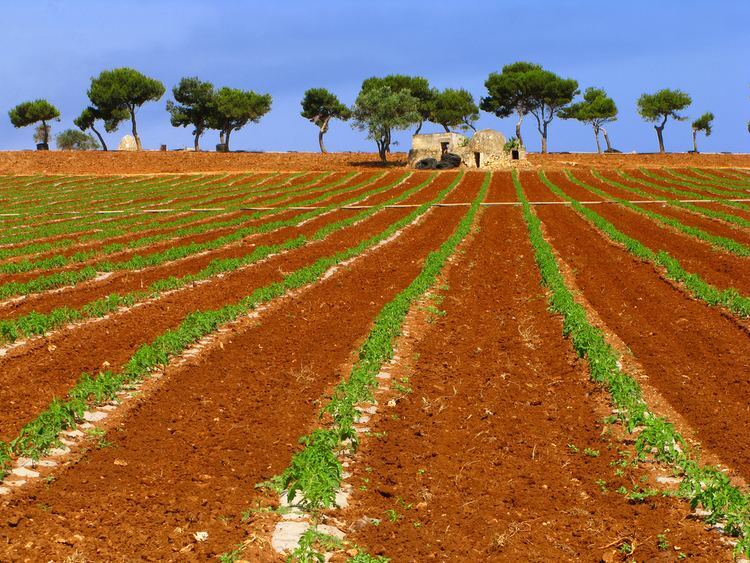 It has also been Istria's administrative centre since ancient Roman times. Evidence of the presence of Homo erectus 1 million years ago has been found in the cave of Šandalja near Pula/Pola. Pottery from the Neolithic period (6000–2000 BC), indicating human settlement, has been found around Pula – Pola. In the Bronze Age (1800–1000 BC), a new type of settlement appeared in Istria, called 'gradine', or Hill-top fortifications. Many late Bronze Age bone objects, such as tools for smoothing and drilling, sewing needles, as well as spiral bronze pendants, have been found in the area around Pula/Pola. The type of materials found in Bronze Age sites in Istria connects these with sites along the Danube. The inhabitants of Istria in the Bronze Age are known as Proto Illyrians. Greek pottery and a part of a statue of Apollo have been found, attesting to the presence or influence of Greek culture. Greek tradition attributed the foundation of Polai to the Colchians, mentioned in the context of the story of Jason and Medea, who had stolen the golden fleece. The Colchians, who had chased Jason into the northern Adriatic, were unable to catch him and ended up settling in a place they called Polai, signifying "city of refuge". In classical antiquity, it was inhabited by the Histri, a Venetic or Illyrian tribe recorded by Strabo in the 1st century AD The Istrian peninsula was conquered by the Romans in 177 BC, starting a period of Romanization. The town was elevated to colonial rank between 46–45 BC as the tenth region of the late Roman Republic, under Julius Caesar. During that time the town grew and had at its zenith a population of about 30,000. It became a significant Roman port with a large surrounding area under its jurisdiction. During the civil war of 42 BC of the triumvirate of Octavian, Mark Antony and Lepidus against Caesar's assassins Brutus and Cassius, the town took the side of Cassius, since the town had been founded by Cassius Longinus, brother of Cassius. After Octavian's victory, the town was demolished. It was soon rebuilt at the request of Octavian's daughter Iulia and was then called Colonia Pietas Iulia Pola Pollentia Herculanea. The colony was part of Venetia et Histria, a region of Roman Italy. Great classical constructions were built of which a few remain. 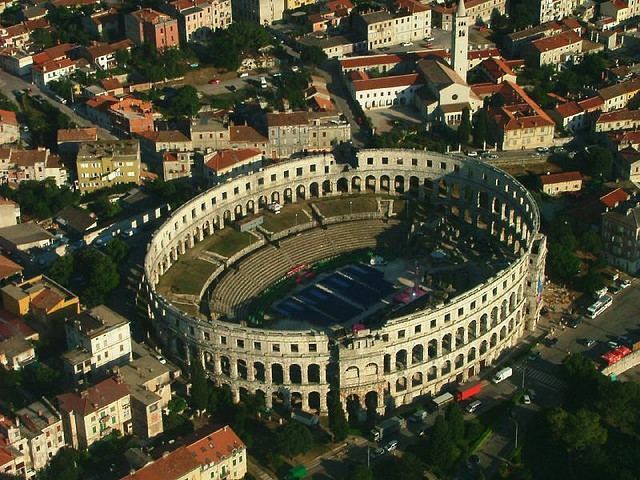 A great amphitheatre, Pula Arena, was constructed between 27 BC – 68 AD, much of it still standing to this day. The Romans also supplied the city with a water supply and sewage systems. They fortified the city with a wall with ten gates. A few of these gates still remain: the triumphal Arch of the Sergii, the Gate of Hercules (in which the names of the founders of the city are engraved) and the Twin Gates. During the reign of emperor Septimius Severus the name of the town was changed into "Res Publica Polensis". The town was the site of Crispus Caesar's execution in 326 AD and Gallus Caesar's execution in 354 AD. In 425 AD the town became the centre of a bishopric, attested by the remains of foundations of a few religious buildings. After the fall of the Western Roman Empire, the city and region were attacked by the Ostrogoths, Pola being virtually destroyed by Odoacer, a Germanic foederati general in 476 AD The town was ruled by the Ostrogoths from 493 to 538 AD. When their rule ended, Pola came under the rule of the Exarchate of Ravenna (540–751). During this period Pola prospered and became the major port of the Byzantine fleet and integral part of the Byzantine Empire. The Basilica of Saint Mary Formosa was built in the 6th century. From 788 on Pola was ruled by the Frankish Empire under Charlemagne, with the introduction of the feudal system. Under the Franks it was part of the Kingdom of Italy. Pola became the seat of the elective counts of Istria until 1077. The town was taken in 1148 by the Venetians and in 1150 Pola swore allegiance to the Republic of Venice, thus becoming a Venetian possession. For centuries thereafter, the city's fate and fortunes were tied to those of Venetian power. It was conquered by the Pisans in 1192 but soon reconquered by the Venetians. In 1238 Pope Gregory IX formed an alliance between Genoa and Venice against the Empire, and consequently against Pisa too. As Pola had sided with the Pisans, the city was sacked by the Venetians in 1243. It was destroyed again in 1267 and again in 1397 when the Genoese defeated the Venetians in a naval battle. Pola then slowly went into decline. This decay was accelerated by the infighting of local families: the ancient Roman Sergi family and the Ionotasi (1258–1271) and the clash between Venice and Genoa for the control of the city and its harbour (late 13th and 14th centuries). In 1291, by the Peace of Treviso, Patriarch Raimondo della Torre gained the city as part of the secular realm of the Patriarchate of Aquileia, only to lose it to Venice in 1331, which then held it until its downfall in 1797. Pola is quoted by the Italian poet Dante Alighieri, who had visited Pola, in the Divine Comedy: "Sì come a Pola, presso del Carnaro, ch'Italia chiude e i suoi termini bagna" or "As Pola, along the Quarnero, that marks the end of Italy and bathes its boundaries". The Venetians took over Pula in 1331 and would rule the city until 1797. During the 14th, 15th and 16th centuries, Pula was attacked and occupied by the Genoese, the Hungarian army and the Habsburgs; several outlying medieval settlements and towns were destroyed. In addition to war, the plague, malaria and typhoid ravaged the city. By the 1750s there were only 3,000 inhabitants left in ancient city, an area now covered with weeds and ivy. With the collapse of the Venetian Republic in 1797 following Napoleon's Treaty of Campo Formio, the city became part of the Habsburg Monarchy. It was invaded again in 1805 after the French had defeated the Austrians. It was included in the French Empire of Napoleon as part of the Kingdom of Italy, then placed directly under the French Empire's Illyrian Provinces. In 1813, Pola (with Istria) came back to the Austrian Empire. Under the compromise of 1867, the town — under the original Italian name, Pola — remained in Austria-Hungary until the latter's defeat and dissolution in 1918. Under Austrian rule, Pola regained prosperity. Its large natural harbour became Austria's main naval base and a major shipbuilding centre. It was chosen for the base in 1859 by Hans Dahlerup, a Danish admiral in the service of Austria. Subsequently, Pola grew from a fading provincial town into an industrial city. The famous island of Brioni (in Croatian renamed Brijuni) to the south of Pola became the summer vacation resort of Austria's Habsburg royal family. In World War I, the port was the main base for Austro-Hungarian dreadnoughts and other naval forces of the Empire. During this period many inhabitants were Italian speaking. The 1910 Austrian census recorded a city population of 58,562 (45.8% Italian speaking; 15.2% Croatian, the rest were mostly German speaking military). Following the collapse of Austria-Hungary in 1918, Pola and the whole of Istria – except the territory of Castua Kastav – went to Italy. Pola became the capital of the Province of Pola. The decline in population after World War I was mainly due to economic difficulties caused by the withdrawal of Austro-Hungarian military and bureaucratic facilities and the dismissal of workers from the shipyard. Under the Italian Fascist government of Benito Mussolini, non-Italians, especially Croatian residents who came to Pola under Austro-Hungarian rule, faced stringent political and cultural repression because they had now to integrate themselves into the Kingdom of Italy and learn the Italian language. Many left the city and went back to the newly created Jugoslavija, where their homes were. After the collapse of Fascist Italy in 1943, the city was occupied by the German Wehrmacht and remained a base for U-boats. Consequently, the city was subjected to repeated Allied bombing from 1942–1944. In the last phase of the war, Pola saw the arrest, deportation and execution of people suspected of aiding the partisans who together with the Jugoslav communists killed many soldiers and civilians. For two years after 1945, Pola was administered by the Allied Military Government for Occupied Territories (AMG). Pola formed an enclave within south Istria that was occupied by Jugoslavia since 1945 with the help of Churchill. The AMG was occupied by a company of the United States 351st Infantry and a British battalion of the 24th Guards Brigade. Istria was partitioned into occupation zones until the region became officially united with the Socialist Federal Republic of Yugoslavia (SFR Yugoslavia) on 15 September 1947, under terms of the Paris Peace Treaties. The city became part of the SFR Yugoslavia, upon the ratification of the Paris Peace Treaties on 15 September 1947 — which also created the Free Territory of Trieste that ultimately reverted to Italy. Initially Pola's population of 45,000 was largely made up of ethnic Italians. However, between December 1946 and September 1947, most of the Italian residents fled to Italy during the Istrian exodus. 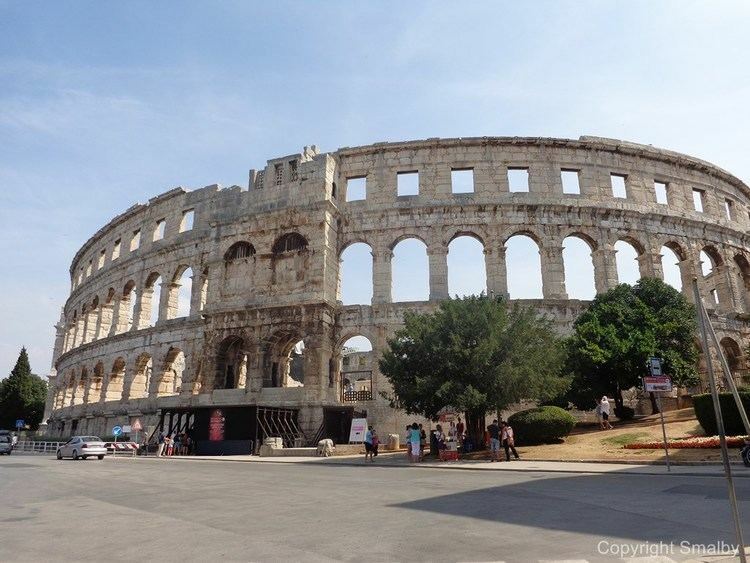 Subsequently, the city's Croatian name, Pula, became the official name. Today the city of Pola or Pula is officially bilingual, hence both Pula or Pola are official names. Since the collapse of Yugoslavia in 1991, Pula-Pola has been part of the newly created Republic of Croatia. Today, Pula/Pola's geographical area amounts to 5,165 hectares (12,760 acres), 4,159 hectares (10,280 acres) on land and 1,015 hectares (2,510 acres) at sea, bounded from the north by islands Sv. Jerolim and Kozada, city areas Štinjan/Stignano, Veli Vrh/Monte Grande and Sianna with its 'Kaiserwald' forest; from the east area Monteserpo, Valmade, Busoler and Valdebek; from the south with the old gas works, commercial port Veruda and island Veruda; and from the west Verudela, Lungomare and Musil. Protected from the north by the mountain chain of Alps as well the inner highland, the climate is humid subtropical (Köppen climate classification: Cfa), very pleasant, with the highest air temperature averaging 24 °C (75 °F) during August and lowest averaging 6 °C (43 °F), in January. Summers are usually warm during the day and cooler near the evening, although some strange heat wave patterns are also common. Normally, there is a lot of moisture in the air. Temperatures above 10 °C (50 °F) last for more than 240 days a year. There are two different kinds of winds here – the bora brings cold and clear weather from the north in winter, and the southern Sirocco bringing rain in summer. The 'Maestral' is a summer breeze blowing from the inland to the sea. Like the rest of the region Pula – Pola is known for its mild climate, tame sea, and unspoiled nature with an average of sunny days of 2,316 hours per year or 6.3 hours a day, with an average air temperature of 13.7 °C (56.7 °F) (6.1 °C (43.0 °F) in February to 26.4 °C (79.5 °F) in July and August) and sea temperature from 7 °C (45 °F) to 26 °C (79 °F). Pula/Pola is the largest city in Istria County, with a metropolitan area of 90,000 people. The city itself has 57,460 residents (census 2011), while the metropolitan area includes Barban/Barbana (2,802 residents), Fažana/Fasana (3,050 residents), Ližnjan/Lisignano (2,945 residents), Marčana/Marciana (3,903 residents), Medulin/Medolino (6,004 residents), Svetvinčenat/Sanvicenti (2,218 residents) and Vodnjan/Dignanon (5,651 residents). Its population density is 1,093.27 inhabitants per square kilometre (2,831.6/sq mi), ranking Pula – Pola fifth in Croatia. Its birth rate is 1.795 per cent and its mortality rate is 1.014 per cent (in 2001 466 people were born and 594 deceased), with a natural population decrease of −0.219 per cent and vital index of 78.45. The majority of its citizens are Croats representing 70.14% of the population (2011 census). The largest ethnic minorities are: 3,454 Serbs (6.01 per cent), 2,545 autochthonous Italians (4.43 per cent), 2,011 Bosniaks (3.5 per cent), 549 Slovenians (0.96 per cent). The city is best known for its many surviving ancient Roman buildings, the most famous of which is its 1st-century amphitheatre, which is among the six largest surviving Roman arenas in the world. and locally known as the Arena. This is one of the best preserved amphitheatres from antiquity and is still in use today during summer film festivals. During the World War II Italian fascist administration, there were attempts to dismantle the arena and move it to mainland Italy, which were quickly abandoned due to the costs involved. Two other notable and well-preserved ancient Roman structures are the 1st-century AD triumphal arch, the Arch of the Sergii and the co-eval temple of Rome and Augustus, built in the 1st century AD built on the forum during the reign of the Roman emperor Augustus. The Gate of Hercules dates from the 1st century. At the top of the single arch one can see the bearded head of Hercules, carved in high-relief, and his club on the adjoining voussoir. A damaged inscription, close to the club, contains the names of Lucius Calpurnius Piso and Gaius Cassius Longinus who were entrusted by the Roman senate to found a colony at the site of Pula. Thus it can be deduced that Pula was founded between 47 and 44 BC. The Augustan Forum was constructed in the 1st century BC, close to the sea. In Roman times it was surrounded by temples of Jupiter, Juno and Minerva. This Roman commercial and administrative centre of the city remained the main square of classical and medieval Pula – Pola. It still is the main administrative and legislative centre of the city. The temple of Roma and Augustus is still preserved today. A part of the back wall of the temple of Juno was integrated into the Communal Palace in the 13th century. Two Roman theatres have withstood the ravages of time: the smaller one (diameter c. 50 m; 2nd century AD) near the centre, the larger one (diameter c. 100 m; 1st century AD) on the southern edge of the city. The Byzantine chapel of St. Mary Formosa was built in the 6th century (before 546) in the form of a Greek cross, resembling the churches in Ravenna. It was built by deacon Maximilian, who became later Archbishop of Ravenna. It was, together with another chapel, part of a Benedictine abbey that was demolished in the 16th century. The floors and the walls are decorated with 6th-century mosaics. The decoration bears some resemblance to the Mausoleum of Galla Placidia at Ravenna. The wall over the door contains a Byzantine carved stone panel. The 15th-century wall paintings may be restorations of Early Christian paintings. When the Venetians raided Pula in 1605, they removed many treasures from this chapel to Venice, including the four columns of oriental alabaster that stand behind the high altar of St Mark's Basilica. The Cathedral of the Assumption of the Blessed Virgin Mary was built in the 6th century, when Pula – Pola became the seat of a bishopry, over the remains over the original site where the Christians used to gather and pray in Roman times. It was enlarged in the 10th century. After its destruction by Genoese and Venetian raids, it was almost completely rebuilt in the 15th century. It got its present form when a late Renaissance façade was added in the early 16th century. The church still retains several Romanesque and Byzantine characters, such as some parts of the walls (dating from the 4th century), a few of the original column capitals and the upper windows of the nave. In the altar area and in the room to the south one can still see fragments of 5th- or 6th-century floor mosaics with memorial inscriptions from worshippers who paid for the mosaics. The windows of the aisles underwent reconstruction in Gothic style after a fire in 1242. The belfry in front the church was built between 1671 and 1707 with stones form the amphitheatre. There also used to stand a baptistery from the 5th century in front of the church, but it was demolished in 1885. The Orthodox Church of St. Nicholas with its Ravenna-style polygonal apse, originally dates from the 6th century, but was partially rebuilt in the 10th century. In 1583 it was assigned to the Orthodox community of Pula – Pola, mainly immigrants from Cyprus and Nauplion. The church owns several icons from the 15th and the 16th century and an iconostasis from the Greek artists Tomios Batos from the 18th century. The star-shaped castle with four bastions is situated on top of the central hill of the old city. 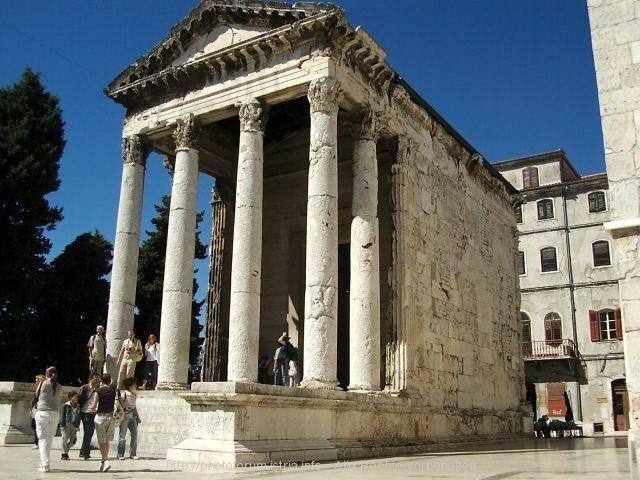 It was built, over the remains of the Roman capitolium, by the Venetians in the 17th century, following the plans of the French military architect Antoine de Ville. Since 1961 it now houses the Historical Museum of Istria. Close by, on the north-eastern slopes, one can see the remains of a 2nd-century theatre. The Church of St. Francis dates from the end of the 13th century. It was built in 1314 in late Romanesque style with Gothic additions such as the rose window. The church consists of a single nave with three apses. An unusual feature of this church is the double pulpit, with one part projecting into the street. A 15th-century wooden polyptych from an Emilian artist adorns the altar. The west portal is decorated with shell motifs and a rose window. The adjoining monastery dates from the 14th century. The cloisters display some antique Roman artefacts. The Archaeological Museum of Istria is situated in the park on a lower level than the Roman theatre and close to the Twin Gates. Its collection was started by Marshall Marmont in August 1802 when he collected the stone monuments from the temple of Roma and Augustus. The present-day museum was opened in 1949. It displays treasures from Pula/Pola and surroundings from prehistory until the Middle Ages. The building was constructed under Austro-Hungarian rule and was the former k.u.k. 'Staatsgymnasium', the Austrian highschool. The Aquarium Pula is the biggest aquarium in Croatia, located in the Austro-Hungarian fortress Verudela, which was built in 1886 on the peninsula 3 km (2 mi) from the centre of the city of Pula/Pola. Transforming the fortress into the aquarium has been in progress since 2002. The installation encompasses about 60 tanks on the ground floor, the moat, and the first floor of the fortress. In an area of approximately 2,000 m2 (21,528 sq ft), visitors can view inhabitants of the Northern and Southern Adriatic Sea, tropical marine and freshwater fish and with representatives of European rivers and lakes. From the roof of the fort, visitors may view the entire city of Pula. It is also possible to see the first marine turtle rescue centre in Croatia. Fort Bourguignon is one of many fortresses in Pula – Pola that the Austrian empire erected to protect the port for its navy. As a result of its rich political history, Pula – Pola is a city with a cultural mixture of people and languages from the Mediterranean and Central Europe, ancient and contemporary. Pula/Pola's architecture reflects these layers of history. Residents are commonly fluent in both Croatian and Italian language but also to foreign languages like German and English. From 30 October 1904 to March 1905 Irish writer James Joyce taught English at the Berlitz School; his students were mainly Austro-Hungarian naval officers who were stationed at the Naval Shipyard. While he was in Pola he organised the local printing of his broadsheet The Holy Office, which satirised both William Butler Yeats and George William Russell. The natural beauty of Pula/Pola's surrounding countryside and turquoise water of the Adriatic have made the city an internationally popular summer vacation destination. The pearl nearby is Brioni island or Brijuni national park visited by numerous world leaders since it was the summer residence of Josip Broz Tito. Roman villas and temples still lie buried among farm fields and along the shoreline of the dozens of surrounding fishing and farming villages. The coastal waters offer beaches, fishing, wreck dives to ancient Roman galleys and World War I warships, cliff diving, and sailing to unspoiled coves and islands large and small. Pula – Pola is the end point of the EuroVelo 9 cycle route that runs from Gdańsk on the Baltic Sea through Poland, the Czech Republic, Austria, Slovenia and Croatia. It is possible to track dinosaur footprints on the nearby sea shores; certain more important finds have been made at an undisclosed location near Bale. Pula/Pola had an electric tramway system in the early 20th century. It was built in 1904 as a part of Pula's economic crescendo during the Austro-Hungarian rule. After World War I, during the Fascist rule, the need for tram transportation declined and it was finally dismantled in 1934. Pula Airport is located north-east of Pula/Pola, and serves both domestic and international destinations. Similarly to nearby Rijeka Airport, it is not a major international destination. However, this is likely to change as low-cost airline, Ryanair has started scheduled flights to Pula since November 2006. Jet2 also offer flights from Newcastle, Birmingham, Glasgow, Leeds-Bradford, Belfast, Manchester and East Midlands Airports. Scandinavian Airlines (SAS) operate scheduled flights from Stockholm and Copenhagen during summertime. Nearby international airports include Trieste in Italy, Zagreb, Croatia's capital and Ljubljana, Slovenia's capital. There are direct flights into Pula airport from London and Dublin during whole year and several other large airports in Western Europe during summer. On 9 April 2015 European Coastal Airlines established a daily seaplane service from the downtown seaplane terminal at the city's main waterfront. Destinations as of April 2015 are Rijeka, the island of Rab and Mali Losinj. A train service operates north from Pula/Pola through to Slovenia, however the line remains disconnected from the rest of the Croatian Railways network. Plans to tunnel the 'missing link' between this line and from Rijeka have existed for many years, and despite work commencing on this project previously, has never seen completion. Passenger ferries also operate from the port area to nearby islands, and also to Venice and Trieste in Italy from June till September.